NDP Leader Tom Mulcair, Liberal Leader Justin Trudeau, and Conservative Leader Stephen Harper campaign at various events on Sunday, Oct. 18, 2015. According to the latest tracking by Nanos Research for CTV News and the Globe and Mail, Liberal Leader Justin Trudeau is up about 10 points on the preferred prime minister measure compared to a month ago. Meanwhile, NDP Leader Tom Mulcair has fallen about 10 points, and Conservative Leader Stephen Harper has remained relatively unchanged. Respondents were asked "Of the current federal political party leaders, could you please rank your top two current local preferences for Prime Minister?" While NDP support has slid in recent polls, pollster Nik Nanos said Thomas Mulcair's personal popularity is still strong. "Mulcair's personal numbers are still very good," Nanos said on CTV's News Channel on Monday. "And there's a significant proportion of Canadians that would consider voting for the NDP." However, Nanos said, many voters have come to view Trudeau as the leader most capable of defeating Harper. 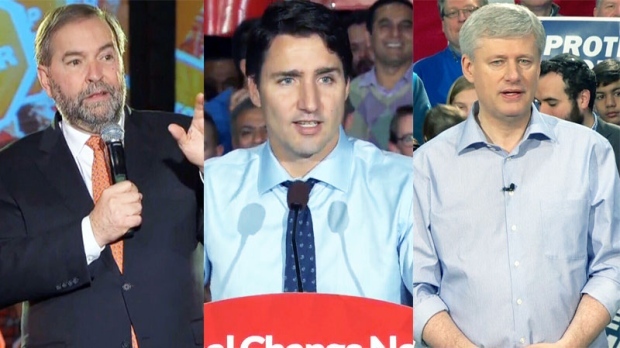 Despite an early onslaught of attack ads, Trudeau ran a smooth campaign, the pollster said. "There hasn't been anything to repel voters in terms of Justin Trudeau's personal performance during the campaign," Nanos said. "Justin Trudeau himself has had a fairly good campaign. We still haven't seen any gaffes, and this has been a gruelling, long campaign for all of the federal party leaders." A national dual-frame (land and cell) random telephone survey is conducted nightly by Nanos Research throughout the campaign using live agents. Each evening a new group of 400 eligible voters are interviewed. An oversample of 800 interviews were conducted on Friday and Saturday. The daily tracking figures are based on a three-day rolling sample composed of 2,000 interviews. To update the tracking a new day of interviewing is added and the oldest day dropped. The margin of error for a survey of 2,000 respondents is ±2.2 percentage points, 19 times out of 20. Today's three-day rolling average is based on 2,000 interviews (800 interviews Saturday, 800 interviews Friday and 400 interviews Thursday).